Can Sauerkraut Get Rid of Acne? Can sour cabbage – ie. sauerkraut – help you get rid of acne? Really…. sour cabbage? ……. you want me to eat….. what? YES! Sour cabbage! But I’m not talking about limp, mushy, vinegary sauerkraut that North Americans are used to putting on their hot dogs. I’m talking about lightly tangy, crisp, fermented cabbage made lovingly at home with a hint of dill and caraway seeds. Sounds delightful, don’t it? Okay, but what does sauerkraut have to do with acne? Well, sauerkraut is traditionally a fermented food. Fermentation is when bacteria break down complex compounds in a substance and makes them simpler – essentially they pre-digest them for you – usually changing the taste and texture in the process. The long and short of it is that, generally, fermented foods are great for improving your digestion because of the easy absorption of them and the beneficial bacteria for your guts. 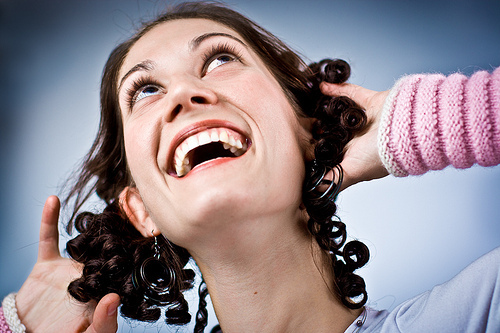 And if you are eating healthy food and digesting it well – acne doesn’t stand a chance! Each fermented food is slightly different with how it can help you with your digestion, because each one is made with different strains of bacteria. Eating 1/4 of a cup with each meal is one of the best ways to get your stomach to produce enough stomach acid if it doesn’t already, which is very important to absorbing minerals, killing bad bacteria, and digesting proteins (so they don’t go on to become allergens). It’s the lactic acid produced by the lactobacillus bacteria that give sauerkraut this special trait. It improves good bacteria in your guts. The Lactobacillus bacteria founds in sauerkraut is a star at colonizing your intestinal tract and improving your inner ecosystem, which is super important for a whole host of reasons including proper assimilation of nutrients. Yeah I know that sour cabbage sounds very yuck, but homemade sauerkraut is actually quite nice and goes very well as a side dish to many meals – not just sausages. And if you don’t like the taste that much or just get sick of it, mixing it with your food or adding a little tahini or nut butter seems to do the trick! (Example: I just mixed some with an indian curry style dish and it was awesome! That’s right… German-Indian fusion). It’s made with a benign ingredient. People react very different to fermented foods made out of dairy products or grain products (such as yogurt or sourdough bread), but cabbage is pretty safe for most! It’s loaded with Vitamin C.
Fermented cabbage has almost 20 times as much available Vitamin C for you as opposed to just cabbage, which is an important vitamin for repairing the skin and keeping it smooth and firm. It contains the natural cancer fighting compounds isothiocyanate and sulphoraphane. Plus, the enzymes in sauerkraut boost your own enzymes, especially those essential to cell rejuvenation, toxin elimination and immune response (all important for beautiful skin). It’s one of the cheapest and easiest probiotics you can get. Probiotic supplements can be expensive to use long term, and most fermented foods require locating and buying some kind of starter culture. Cabbage, on the other hand, has all the bacteria you need found naturally in the leaves. All you really need is cabbage, sea salt, and some large glass mason jars. So…. for those of you who didn’t like science class, you may be asking….. which store can I buy this at? Here’s the thing – the sauerkraut you would buy in a jar off the shelf of the grocery store is completely useless. Most commercial sauerkraut isn’t even made with fermentation anymore, it’s just made with vinegar. And even if it originally was made with fermentation, it’s likely that it was pasteurized afterwards – meaning that it was heated to high temperatures and the beneficial bacteria is all dead. And even if it wasn’t pasteurized, if it’s been sitting on the shelf at room temperature – yep. They’re likely to be in their graves. The only sauerkraut you should buy if you want the benefits for your skin is freshly made, refrigerated sauerkraut that specifically says it’s not been pasteurized. You may get lucky and find it at a health store. Don’t ask me how much this would cost, but I’m certain that if you are eating 1/4 of a cup of it with each meal that it’s not very cost effective. Anyhoo…I just made my very first batch of sauerkraut and I’m really excited about it!! It turned out great. I took loads of photos of the process so next post….. you get to learn how to make it!! Woohoo!!! Wow! I’m so excited to see how you made it! Both sides of my family are very German and sauerkraut was a big part of our meals growing up. My mom still makes it, but knowing all this, I’d love to start making my own. W-A-I-T-I-N-G for your delicious recipe! So stoked to learn how!!! Whole Foods sells a few refrigerated, jarred, raw and organic, unpasteurized sauerkraut. I’m assuming those are fine, is that right? A jar is about 6 bucks. As far as store bought sauerkraut goes, that does sound like the best you will find! I have been eating kraut since your suggestion – the store-bought Bubbies brand and I have really developed an appetite for it! I just have one question: is it most beneficial to consume the solid parts or the liquid – or both? I have been eating the kraut and drinking the liquid, just to be on the safe side. But I was just curious if drinking the liquid would garner the same great effects. I think both have the beneficial bacteria! 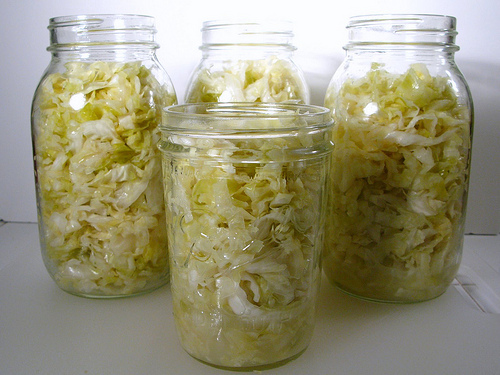 Do you think raw cabbage can work just as well as sauerkraut as a natural probiotic? Wow! Highly informative write up! I am not much of a sauerkraut fan myself and though I do not suffer from acne any more, I’ll surely like it more now that I know how amazingly beneficial it is for the skin. As an after thought, isn’t regular cabbage good for us too?? Hi there – yes cabbage is great too and has lots of healthy properties. But it’s not really the same as sauerkraut simply because the big benefit with sauerkraut is the good bacteria it contains as you have let it ferment! There are many varieties and you can just put in any minced meat you like – it’s really tasty! You can google sarma for more ideas! For those who don’t like the taste of raw fermented cabbage, the cooked version tastes a lot better! Also, any fermented cabbage (kimchi or the Bulgarian version at least) is great to cook with pork (or another type of meat, it just needs to be fatty enough). 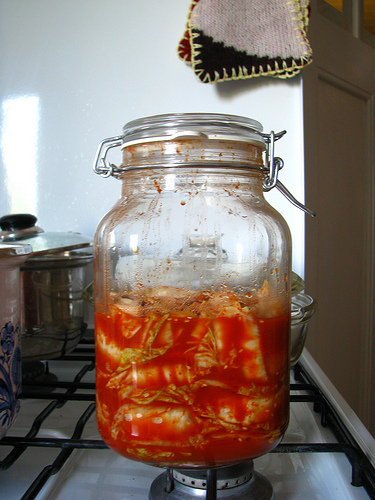 Also, fermented cabbage and paprika go together very well. Two great raw sour krauts that can be found in the grocery store are made by Bubbies and one by Firefly Kitchens. Firefly makes a line of fermented cabbage and one made from carrots, and even a vegan fish/shrimp free, and supposedly stink free, version of kimchi. 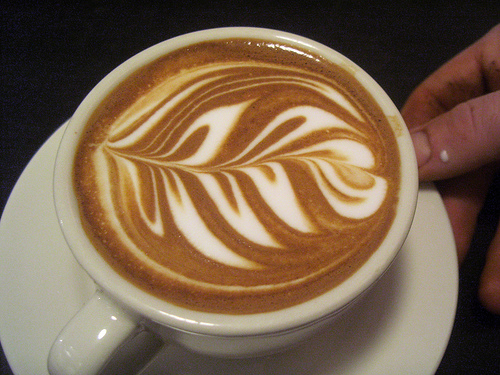 I think with Bubbies you get more bang for your buck though. I have a copy of Nourishing Traditions but I’ve not tried homemade sour kraut yet so I’ll have to try it out. Great post. Thanks for breaking everything down. Didn’t know about the vit C content of cabbage! Good advice – I do think Bubbies is the best sauerkraut choice if you’re going with store bought! I’m also going with the store-bought Bubbies brand – found it for 6 bucks a jar at Whole Foods. Wish it were cheaper, but at least the jar is decent-sized. I also don’t eat it with every meal, since I’m on the go eating out of my lunchbox a lot, but when I’m home, I add a few heaping forkfuls to my plate. I hope I still get the benefits this way…I’m pretty sure I do have low stomach acid. I had chronic acid reflux as a child and still get occasional heartburn. My housemates begged me not to start fermenting in our kitchen so it won’t smell, and I feel obliged to comply lol. It’s a temporary living arrangement and someday soon I do hope to make my own sauerkraut. I didn’t think I’d like it at all, but it’s really delicious! Sort of reminds me of pickles (which I adore). AND my naturopath told me to start eating it. Double score for fermented cabbage. Who knew? Not me. What is the best way adding this stuff to my regimen? Maybe start with 1/3 of a tsp per day to avoid breakouts? Theres no way I would do 1/4 per meal, at least not right away because I have been off antibiotics for about 8 months now after being on it for over 7 years. So im worried that my gut is damaged and needs to heal first before adding any probiotics. Yes, if you feel your gut can’t handle it, the way to go is start off very small and slowly work your way up in tolerance! Well Ive been on it for 7 days now and been doing 1 tsp a day. Cant tell if its doing any good or bad for me. I dont know if I have a leaky gut or not so hard to tell. But I will continue with 1 tsp for a good month if I can. I hear Sauerkraut will make people break out because of the high histamine levels in it. Is histamine really that bad? Want to know who comments after you? Get updates by email. You can also subscribe without commenting.